Augmented reality (AR) is a way of creating layers of digital information on top of the physical world, allowing users to view them through smart devices such as iOS or Android mobile phones. AR allows people to add digital content from a website link, an animation, a 3D model etc. to printed materials, objects and geographical locations. Google Glass is probably the most famous AR project, and one example of its AR applications is allowing you to get instant digital facts of your surroundings according to the GPS. As a technology readily available now, augmented reality holds great potential in education. Education should not only be a watching and listening activity, it should in reality, be done through creating and interacting. Teaching and learning in a 3D world is no longer enough, AR adds a profound digital dimension to education. Designed and released by DAQRI, the Elements 4D enables you to interact with paper or wood blocks which has the names of chemical elements. Through an augment reality app, the elements come to life and demonstrate how they interact in nature. This App applies AR technology to introduce users the anatomy of the human body. You just need to print a target image and then the app will present you the 3D structure of organs and body parts of a human being. You can also change between male and female to get visual understanding of your body. In my opinion, Aurasma is trying to build an augmented reality social community. It provides free tools for users to link interactive digital content, such as video, animations and 3D scenes with real-life images, objects and locations (Auras). You can then publish and share your own AR through Aurasma app. Educators can add instructional information to an object or augmented textbooks and project work. Spacecraft 3D is an AR app released by NASA to teach the public about spacecraft that are used to study the Earth, explore the solar system, and observe the universe. Once you print the AR target image, you can learn about the engineering features of the spacecraft and understand how they work. Star Walk is one of those amazing apps. Launch the app and hold your phone at the night sky, you can explore the extensive information about stars, planets, satellites, and constellations. The star map also updates as you move your phone and if the camera face the ground, the app will show you the start map of the other hemisphere. Augmented Reality is the new dawn that holds a great prospect in the educational world. Although already being applied in some institutes, a lot of people are yet to embrace this development. Making AR technology a part of education will simply make learning much easier, creating and interacting. 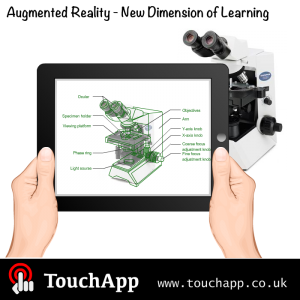 This entry was posted in Education, Technology and tagged AR in education, augmented reality, augmented reality in education, augmented reality in learning, education technology, Mobile App development company, technology in education on May 9, 2014 by touchapp.